It has been forty years since Richard Thompson entered the public stage as co-founder of the Fairport Convention. Since then he has built up a magnificent body of work, and a reputation as one of the finest songwriters and guitarists (both acoustic and electric) on the planet. Somehow, however, he has never received the commercial appeal so richly deserved. The following song, Poppy-Red, recounts the death of a wife or lover (‘Now my love makes her bed where poppies grow over her head’) while Guns are the Tongues recounts the recruiting of young lads into the IRA. Of course, darkness is not new to the Richard Thompson cannon (a 1990s compilation was aptly called ‘Watching the Dark’), but I expect that the level of despair inhabiting many of his songs may come as something as a shock to the uninitiated. Yet Thompson was never one to pander to the tastes of the masses, and this is something that has earned him great loyalty among, ahem, Dickheads (as we are sometimes called!). This album doesn’t contain specific tracks that catch the attention as immediately as, say, Beeswing (1994), 1952 Vincent Black Lightning (1991) or Shoot Out the Lights (1982), but repeated hearings reveal a complex, unified body of songs. A number of the tracks are absolutely superb. Take the Road you Choose contains some of Thompson’s most wistful singing and an achingly beautiful refrain. Francesca has a reggae feel to it, intercut with sharp, inimitable guitar work and wonderful percussion (played by Michael Jerome). The lyrics of Too Late to Come Fishing, in their depiction of a fall from grace conjure memories of Dylan’s It’s All Over Now, Baby Blue. The penultimate track, Guns are the Tongues, packs a dramatic punch, and is surely one of Thompson’s greatest story songs. The guitar line on Sunset Song has echoes of Cold Kisses (from You? Me Us?) and is an evocative and deeply satisfying piece to end this fine album. A word must be said about Danny Thompson (no relation) who provides superb support on most of the songs. One of the greatest living acoustic bass players, he has played on many of the key recordings of the last 40+ years (including those by Pentangle, Bert Jansch, Nick Drake, Tim Buckley, and even Rod Stewart). When the two Thompsons play together (as they have frequently on record and on tour), they virtually never fail to impress. 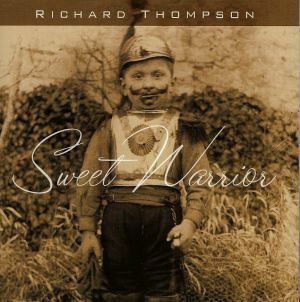 To my mind, Sweet Warrior is Richard Thompson’s finest release since Rumor and Sigh, back in 1991 – an outstanding achievement given the prolific (and excellent) output he has shown in recent years. In the 1960s, Thompson often turned to Bob Dylan’s songs for inspiration. It seems fitting that, decades later, both artists remain at the top of their game when many, if not all, of their contemporaries are left trading on past glories.